There are not too many sites with consumer reviews of this particular mattress but Amazon does have several. The table below indicates that consumers are, in general, very happy with this mattress. According to Dynasty Mattress their mattresses “compare to Tempurpedic mattresses”. They also offer a 20 Year Limited Warranty although some consumers have indicated that the “true’ warranty is 100% for 10 years, 40% for 11-15 years, and 20% for 16-20 years. And frankly speaking paying for shipping to return the mattress at any point would not be inexpensive. 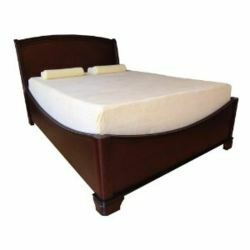 The Queen 12 inch Therapeutic Memory Foam Mattress is 60 inches by 80 inches by 12 inches and weighs about 90 lbs. It is made from 5 inch 100% visco-elastic 5.3LB Memory Foam and 7" High Resilience Polyurethane Base Foam. Memory foam, originally developed by NASA to increase the safety of aircraft cushions, has the unique ability to mould itself around ones body. This ability provides superior comfort and support. The material is also able to recover it’s shape when the pressure is removed. The Queen 12 inch Therapeutic Memory Foam Mattress comes with 2 layers of egg-create base foam to add comfort and it has dual airflow which helps to increase the air circulation within the mattress and reduce mattress temperature. It also comes with a washable four-way zipper cover. When this mattress arrives at your doorstep it is vacuum packed and about an inch thick. But after it is unpacked and allowed to “rest” for several hours it will inflate up to it’s full 12 inches. - Mattress retains heat. May be a little hot if you are sleeping in a warm room. Check out our related article to learn more about Dynasty Mattresses. Or if you are looking for a larger memory foam mattress you may wish to read our review of the Dynasty Mattress King Celebrity.